Zannos Melathron is a member of Relais & Chateaux. It is the place where you will feel like the king of the world. At least this is what thousands of people, who are visiting everyday Pyrgos castle in Santorini, mumble or imagine. You need dream no more. 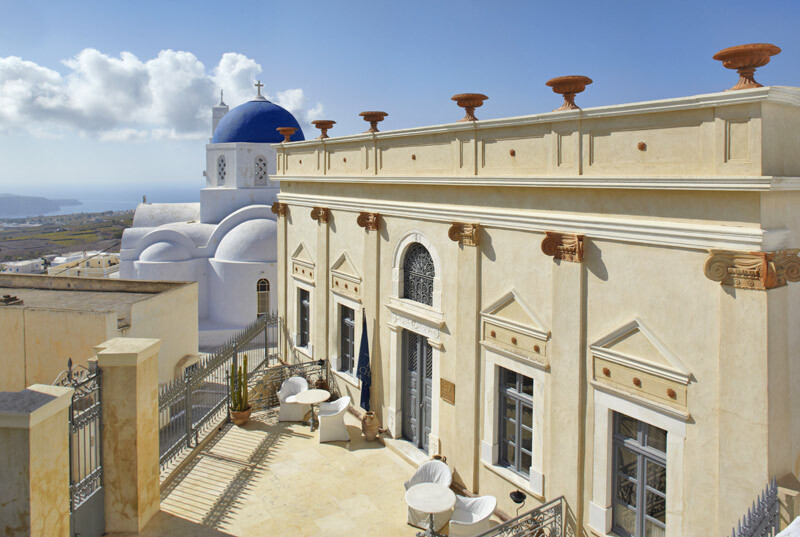 A 19th century mansion built by Michael Zannos, a master of the time, and an adjoined renaissance architecture villa built in 1750, both landmarks, have been renovated and converted into a luxurious small hotel under the artistic supervision of Yannis Tseklenis. A sophisticated hotel offering all around you the natures richest, most rare and most colourful offerings vie for your attention on the island of Santorini. Situated on the highest level of the most picturesque settlement of Pyrgos and right at the entrance of its medieval castle, enjoying the breathtaking view of the entire Island and the Caldera from a unique Belvedere. Next to Profitis Ilias, the most elevated village of the magnificent Island, resting from the highest point of Santorini, reveals the stunning view of the Aegean panorama. An intoxicated blend of fully air-conditioned luxurious suites, flawless service and exquisite gourmet treats. It is opulent and grandiose. It feels like the home of an old, precious friend. Double Suites:1 Double Bedroom, Living Room and Bathroom with bathtub. Senior Suites:1 Double Bedroom, spacious Living Room and Bathroom with bathtub. Villa Zannos Suite: Double bedroom, open plan living room, bathroom with bathtub, sharing cave Jacuzzi. Master Suite:This suite, situated privately in its own courtyard has one spacious Living Room, 2 Double Bedrooms and 2 Bathrooms with bathtubs. Modern facilities, they are always there to remind you that you are staying in one of the most luxurious holiday destinations in Europe. Apart from the private suites, and among its modern facilities offered, Zannos Melathron consists of elegant and eclectic lounges filled with exceptional antiques and modern artworks of high aesthetics. In addition, these lounges can be modulated in order to serve conferences, private parties and cultural events, according to the desires of the guests. Breakfast Served between 08:00 and 11:00 hours either on the lounge-veranda or in the suite by dialling the room service number. A wide variety of items are available on the a la carte menu. Lounge Menu The Lounge menu is available every day from noon till late in the evening and contains a selection of international delicacies and gourmet treats appropriate for any time of the day. La Petite Carte A small selection of dishes available between 17:00 and 19:30 hours. Private Dining A private candlelit dinner for two to six people can be arranged in the old dining hall of the mansion. The Wine Bar In the Zannos Cava you can find a full selection of the worlds most famous and finest Greek wines, including a special Santorini wine from Zannos own vineyards. Wine Tasting Guests can participate at the ceremonial wine tasting and experience a selection of the most famous Santorinian wines. After the wine they can indulge in a selection of Russian Caviars and fine Cigars. The Pool Next to the swimming pool, guests can enjoy their favourite cooling drinks or cocktails, light or full meals and relax to the strains of soft music.